That’s right. The New York Yankees have hit the Broadway stage. The show comes from the same creators of Broadway’s “Lombardi.” The story centers around Yogi Berra and his wife Carmen, as they take you through the New York Yankees storied history. Legendary players such as Ruth, Mantle, DiMaggio, Gehrig, and Jeter are portrayed on the stage. I’d bet this would be a real treat for any Yankees fan to attend, both young and old. Here’s a great clip from the 1928 film, “Speedy,” featuring George Herman Ruth. I’d like to call myself a movie buff, but I’m ashamed to say I never heard of this film before. “Speedy” loses his job as a soda-jerk, then spends the day with his girl at Coney Island. He then becomes a cab driver and delivers Babe Ruth to Yankee Stadium, where he stays to see the game. When the railroad tries to run the last horse-drawn trolley (operated by his girl’s grandfather) out of business, “Speedy” organizes the neighborhood oldtimers to thwart their scheme. If you pay close attention, you can see Lou Gehrig walking as Ruth get sout of the cab. With two hits in last night’s game, Derek Jeter now remains 17 hits shy from joining the 3,000 Hits Club. A feat that hasn’t been reached by the likes of Ruth, Gehrig, DiMaggio or Mantle. Derek will be the first New York Yankee to do so. The club will be on the road for four more days, and will come home for a 10-game home stand, where they will host the Red Sox, Indians and Rangers. New York fans are hoping he will reach the plateau on their home turf in the Bronx. It’s not heaven, it’s Iowa. In the book, “Roger Maris: Baseball’s Reluctant Hero” by Tom Clavin and Danny Peary, chapter one opens up with a story about how Bob Dylan became a fan of Maris during his 1961 home run chase. Are These the Greatest 50 Yankees Ever? ESPN New York released their “50 Greatest Yankees” list the other day. I can’t really argue too much with their list, although I probably would have swapped Thurman Munson (#12) and Bill Dickey (#10). Yes, I know Dickey is in the Hall of Fame and Munson isn’t. But it was Munson’s leadership, as much as anything else that returned the Yankees to their winning ways in the ’70s. And who knows what kind of numbers he would have put up if not for the plane crash? Anyway, here’s their list. I’ve added in the dates they played for the Yanks, along with their position. An asterisk denotes a playing career interrupted by a military commitment; # denotes a Hall-of-Famer. Current players are in red type. Feel free to let us know how you feel about the list! Charlie Sheen is putting on a show for the ages. He’s been captivating audiences with his bizarre ranting about warlocks, trolls and “winning.” I find it all hysterical. 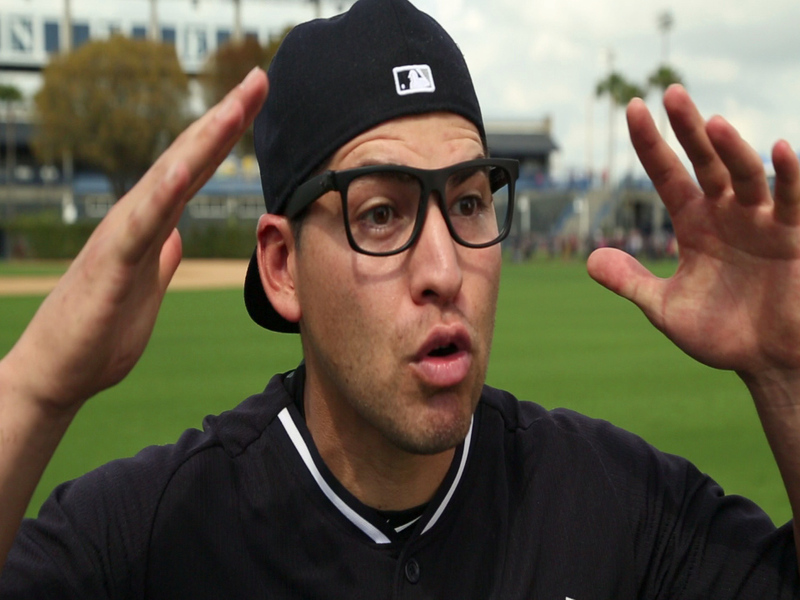 In his latest video, he dons a Yankees warm-up sweatshirt, so I thought he deserved a plug on the blog just for that. This is the same guy who owns Babe Ruth’s 1927 World Series ring, and has a Yankees baseball card. Winning! "You're either in my corner or you're with the trolls." I’m proud to announce that the 2011 Maple Street Press Yankees Annual is only a few weeks away from hitting the newsstands. MSP is taking pre-orders now if you want it hot off the press. Edited by Cecilia Tan, with articles written by several writers, including: Joe McDonald, Howard Megdal, E.J. Fagan and yours truly. I’ve written a piece on Yankees pitching prospect Dellin Betances entitled “The Pride of Brooklyn.” I would just like to thank Cecilia Tan for giving me this opportunity to contribute to the annual. What else is in the magazine? Robinson Cano: Was his MVP-caliber season a fluke or is he barely getting started? The Yankees lineup is filled with greats, but who will eventually get the Hall call? 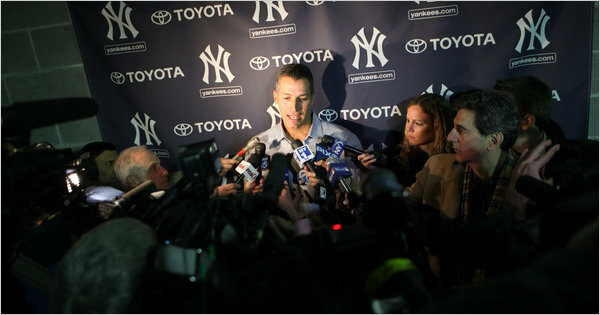 For some reason, a large number of Yankee fans were surprised by the news that Andy Pettitte decided to call it a career. Mr. Mailbag’s inbox is overflowing with questions; I figured this is as good a time to answer them as any. Since Andy isn’t returning this year, does this mean the Yankees season is doomed? Well, afraid…in a word, no. Even if everything stands pat, the current rotation isn’t as bad as everyone seems to think. The line-up should be actually be better than last year’s. Boston did improve their team, but Tampa Bay is much worse. And if we’ve learned one thing about the Yankees in the Steinbrenner era, the Yankees won’t stand pat if the team needs something come mid-season. Barring a sudden surge by a surprise team, the Yankees should wind up in the playoffs in 2011. How can I live without Andy? The Yankees just won’t be the same without him! Well, Crying, you’re not alone. I’ve seen a lot of these in the last 24 hours. I understand that to a certain generation of Yankees fans – pretty much those under the age of 30 – Andy is the starting pitcher of record. But you should understand that what makes the Yankees the most successful franchise in sports history is the way this team replaces great players with other great players. If you’re of the current generation, you probably find it hard to understand how fans of my generation can hold such high regard for Thurman Munson or Chris Chambliss. (To me, Chambliss’ homer in the ’76 ALCS is still the most thrilling Pinstripe moment I’ve ever witnessed). For fans of my father’s generation, it was Mickey Mantle. And on through time it goes, back for 90 years, to the time of the Babe and Lou. There’s a crop of talented players making their way up from the minors now; guys named Betances, Banuelos, Brackman, Montero, and a whole bunch more. Andy Pettitte can’t necessarily be replaced anymore than Munson could. But other great players will come along who will carve out their own dynasties. It’s the Yankee way. How many ballots will it take for Andy Pettitte to get into the Hall of Fame? If it takes more than one, It’s a damn shame! Well, Texas… I hate to break it to you, but Andy probably isn’t getting into the Hall of Fame. He has a borderline case: in his favor, he did finish his career 102 games over .500; right now, only one other pitcher with a similar number isn’t enshrined (oddly, former teammate Mike Mussina). But when compared to the other pitchers of his era; well, his numbers don’t particularly stack up well. His career ERA is higher than that of non-HOF candidates like Kevin Brown, Barry Zito, Tim Hudson, and Al Leiter. If anything, Andy should root really, really hard for Mike Mussina to get a HOF nod – because their final career numbers are eerily similar. In fact, Mussina’s are better than Pettitte’s (higer ERA+, more strikeouts, wins, complete games, higher winning percentage and lower OPS allowed), so you can bet if Mussina doesn’t get in, Pettitte won’t. Plus, Pettitte has the whole PED’s issue hanging over his career. I don’t think in the grand scheme of things it will make a huge difference, but if he’s close and that negatively influences a couple of voters…well, you get the idea. When are the Yankees going to retire #46? Um, Probably never. Was Andy an important cog in the past 5 championships? Yes. Does that mean he’ll get his number retired? No. Consider how many players from the 90’s dynasty have their numbers hanging on the outfield wall. Bernie Williams? Tino Martinez? David Cone? Paul O’Neill? Each was as integral to those championships as Pettitte; each as beloved in the Bronx as Andy – and none has their number retired. I strongly suspect that unless a player winds up in the Hall of Fame, their number will remain in circulation. Why did Andy Pettitte retire? The Yankees need him! Well, alarmed, as Andy said this morning, his heart just isn’t in it anymore. If you’ve watched Andy pitch over the past 5 years, then you know he’s gotten by mostly on heart. His once overpowering cut fastball doesn’t have the life it once did and neither do his secondary pitches. Perhaps more importantly for an athlete his age, he doesn’t have the drive to overcome injury – and a 38 year old pitcher is likely to step out on the mound with a nagging injury as not. Given his current state of mind, he’s making the right decision. Based on physical ability, he’s probably still better than Sergio Mitre. But without that competitive fire, Andy Pettitte would finish his career reminding Yankee fans why we hated Kevin Brown. That’s it for now. These are representative of the most common questions I’ve seen. Somehow, I’m sure there will be more over the weekend, so stay tuned! Oh, and if you have one, feel free to shoot it out to me at Twitter or Facebook! America only wanted one hero…. On October 1, 1961, Roger Maris broke Babe Ruth’s single season home run record (60) on the last game of the season. He ended up with 61 home runs in total. Throughout the 1961 season, Roger was considered an “outsider”, and wasn’t consiered “Yankee material.” Mickey Mantle was an American icon at the time, and a lot of fans didn’t want to see Roger break the record. He wasn’t very big on talking to the media, went about his business in quiet fashion, and was a family man. With all that said, he was sent hate mail by the fans and he was booed out of his own ballpark. Maris’ record stood until Mark McGwire broke it in 1998, totaling 70HR’s on the season. Barry Bonds than hit 72HR’s in 2001. With all the people who admitted using steroids, and allegations surrounding others, many believe (including me) that Roger Maris still holds that single-season home run record. I didn’t grow up at that time, but from what I can tell….that was one magical season.